Standing on the foredeck as we motored out of Las Palmas was a surprisingly emotional experience! Music was pumping across the marina and there were many onlookers lined up and waving us off – a parade of 74 yachts of varying shapes and sizes heading out to the start line ready to tackle the Atlantic crossing…for us, the culmination of over 12 months of planning and preparation. There was a small amount of tactical argy bargey and then we were in our way. With little or no wind we turned on our engine (for a time penalty) and made our way south. Once the northerly trade winds set in we found ourselves in 20 to 30 knots of wind with 5-6 metre swells which made movement around the boat, particularly down below, an interesting cross between ballet and gymnastics! I never thought of myself as a klutz – I have been seen constantly banging into things or pirouetting across the main cabin in an ungainly manner only to end up either on the floor or face planted into the seating area. Just when you think you are in cinq with the movement of the boat she will roll or twist and turn in the opposite direction. James was fast asleep one night (exhausted from an earlier night watch) and I tried to sneak into our cabin holding an armful of clothes. I quietly opened the door and stepped in at exactly the same moment as the boat turned in the opposite direction which resulted in my spectacular lurch sideways; my arm accidentally hit the light switch which woke James, who witnessed my graceless landing (on my ear) on the other side of the cabin. Oops!! Just to top it off, as we were sailing across the finish line in Cape Verdes I fell unceremoniously and twisted my ankle! Thank goodness for 5 days at the marina!! There have been many highlights of our first leg however the food that Michelle has presented us on a daily basis has been truly amazing!! A varied diet of Thai Green Chicken curry, fresh sashimi (with an avocado salsa) followed by pan fried mahi mahi, steak with a butter, parsley and caper sauce, pasta with tuna, olives, red onion, capers, chicken fajitas and seafood paella! Unfortunately we did lose a couple of dishes to the galley floor because of the constantly moving surroundings but it only caused a great deal of hilarity. Watching food cook in the oven which we laughed, is like watching TV in the real world!! Our fishing line has been out on a daily basis (thank you again Rob and Belinda) and Logan hauled in a large Mahi Mahi on day 2. We will continue this on the next leg as it is always very exciting to hear the line run! Sao Vincente, in the Cape Verdes, is an eclectic and interesting mix of Portugese and African culture. 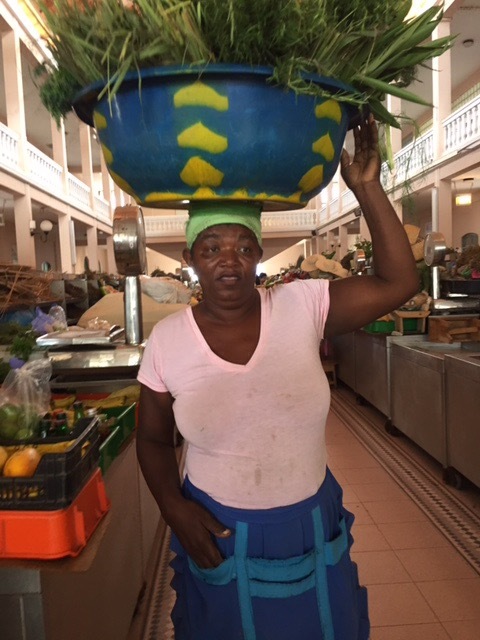 The local market has a delicious array of fresh fruit and vegetables and incredible fresh herbs carried in interesting ways!! We have sadly farewelled one of crew today – Chris Berry…so now it is 6! The next days we plan to spend enjoying the balmy temperatures and sightseeing around some of the islands. Picture “Jurassic Park” and you will have a sense of the dramatic topography of the island group. Entertaining read especially the visual of you flying about the boat! Hello Tiggy, James and your crew. Sounds like you are having a great experience !! And you haven’t missed a thing in Beaufort road ! Thanks Annie & Steve!! All going well! Love love loving your antics dear Tig- keep up the great words! !